About a month ago I applied to be a delegate for my state to attend LIVESTRONG® Day in Washington, D.C. Well HUZZAH and GREAT CELEBRATION is in order! My application was accepted and I’ve been invited to participate in LIVESTRONG® Day as a representative of Utah. I doubt that I’m the ONLY delegate from Utah, as my application, I decided in retrospect, made me sound slightly CRAZY, though qualified in many respects. They would probably want someone else around from the state to mitigate any insanity. I would like to solicit ideas from anyone with a vested interest in cancer-related issues. Please let me know what issues you’d like be discussed in Washington and will do my best to accommodate you (unless you propose that I go and petition for “National Wear an Armadillo as a Hat Day” – it may already exist, anyway – as a turophile I was relieved to find that “Cheese Sacrifice Purchase Day” and “Moldy Cheese” day BOTH exist – July 29th and October 9th, respectively – and that’s despite the fact that we have an official dairy MONTH and a cheesecake day…). ‘Kay. I should probably get back to the issue and hand. The Lance Armstrong Foundation provides the airfare and hotel accomodations for all LIVESTRONG® Day delegates, and the registration fee is fairly nominal (and I am applying for a scholarship for that fee). AND I do believe there is FREE T-SHIRT involved! Because my expenses will be minimal (and you COULD assist me with those costs by buying cheese and books, etc. 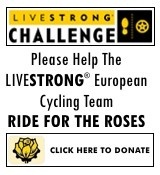 from my affiliate sites on my right-hand sidebar…), I have committed myself to the larger fundraising effort for the LIVESTRONG® European Cycling Team. I love the fact that it is an International collaborative effort, and if we can reach the lofty goals set by the team, IMAGINE what that money could do for cancer research, treatment and advocacy! Anyhoo, as my voice will be heard on Capitol Hill, I really would like to express the collective concerns of our community, this state, the US and yes, even the world – while I have this unique opportunity. Otherwise, I might just try and filibuster something for the hell of it. Oh – David and Julianne? I’m coming to visit you right after LIVESTRONG® Day. SURPRISE! Quite apart from finding a cure – and I’m sure you know that there are conspiracy theories floating around in that regard — I would sure like to know what part of the health-care system considers it CARE or HEALTH when someone is finally released from palliative care and left to wither away at home, unable to eat, walk or talk, with just morphine to ease the pain of the next few days, weeks or worse yet, months. We can put down cats, dogs, and horses, but we can’t seem to give the dying a better way out of their misery. Address THAT in Washington. And best of luck. I didn’t work in Medical Ethics and learn about palliative and end-of-life care for nothing. Believe me – it’s one of my BIGGEST concerns. We are no longer sisters-in-law. But it is cool that you’re doing all that. Congrats. But still not sisters-in-law. If everyone we knows buys LOTS AND LOTS of cheese I’m COMING TO KANSAS. Pip is glad that even though Pip is well….Pip… Pip can come here and randomly comment and find amusement…. because Pip is bored… Maybe Pip should give you more updates on… things…. Pip will have to talk to Pip’s cohorts… or those people-.. type… entity.. things…. maybe Pip will have to get back to you…..